Bauer College marketing senior Camille Corales was recognized by the American Marketing Association – Houston, receiving the 2016 Penny Todd Scholarship. One of the nation’s largest professional marketing organizations recently recognized a Bauer College student for leadership efforts within the college and the Houston community. Bauer College marketing senior Camille Corales is the 2016 recipient of the Penny Todd Scholarship from the American Marketing Association – Houston. The award honors past AMA Houston president Penny Todd and is presented annually to a college student who demonstrates extraordinary leadership and philanthropy efforts within the Houston marketing community. Corales currently serves as president of the student chapter of AMA at Bauer and has participated in the organization for four years. 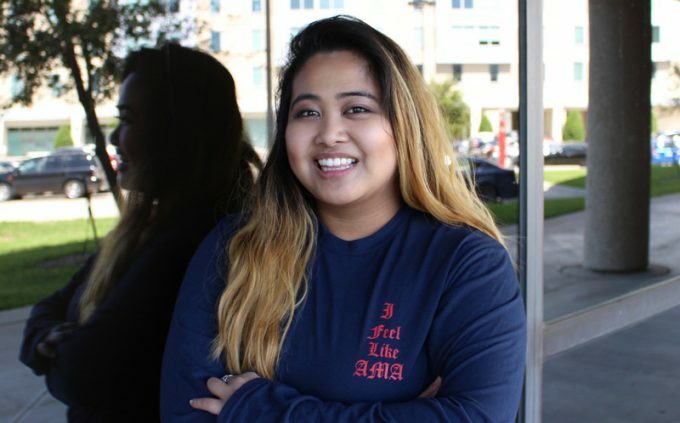 She helped launch the student chapter’s Big/Little mentorship program and the Cougar Creative Marketing Firm, which aims to provide students with real-world marketing experience. “I wanted to create the Cougar Creative Marketing Firm to help students that may not have job experience set themselves apart,” Corales said. In addition to her role with AMA, Corales has also served as vice president for the Collegiate Entrepreneurs Organization and secretary for the Energy Coalition. She also gives back to the local community through volunteer efforts with the Houston Food Bank, Sunrise Senior Living and The Beacon. Corales is interning with Direct Energy and plans to graduate in May before eventually launching her own business.